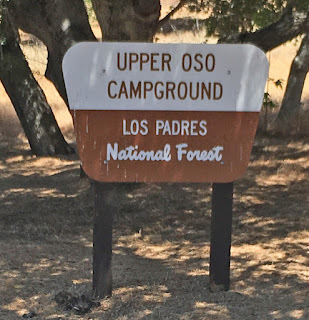 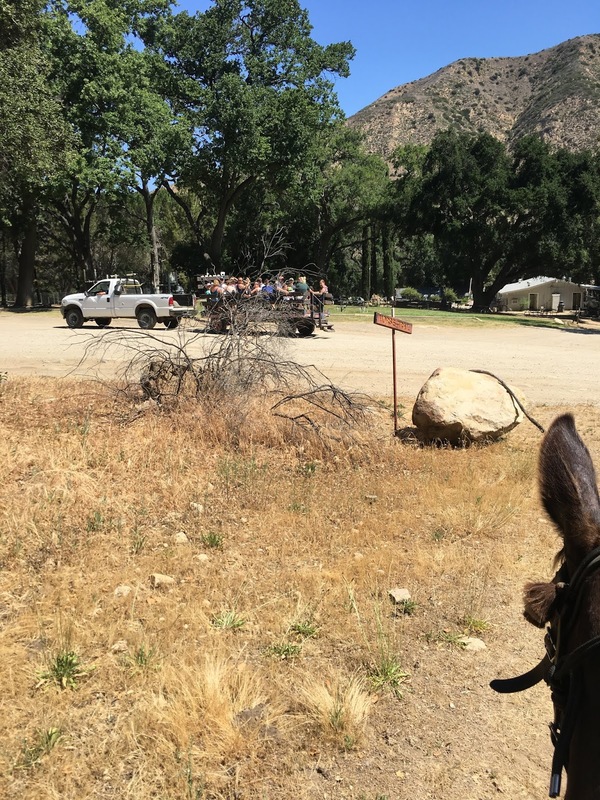 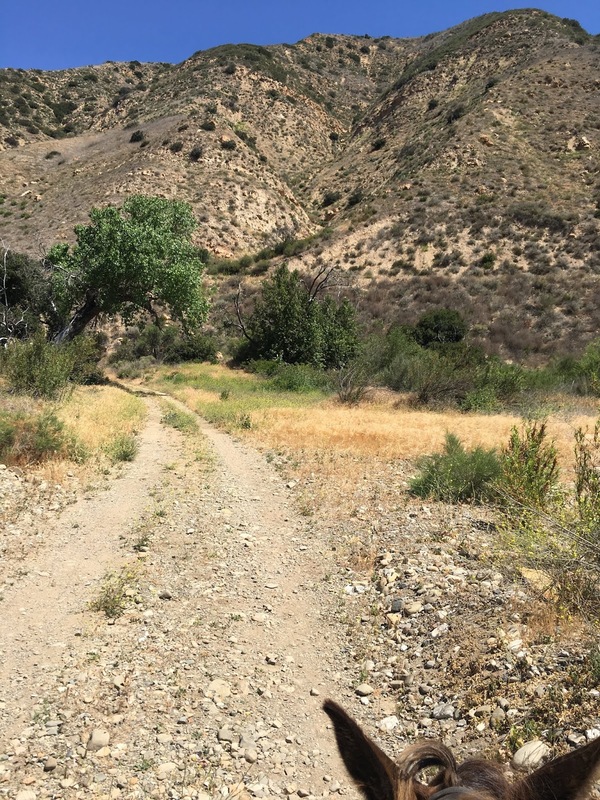 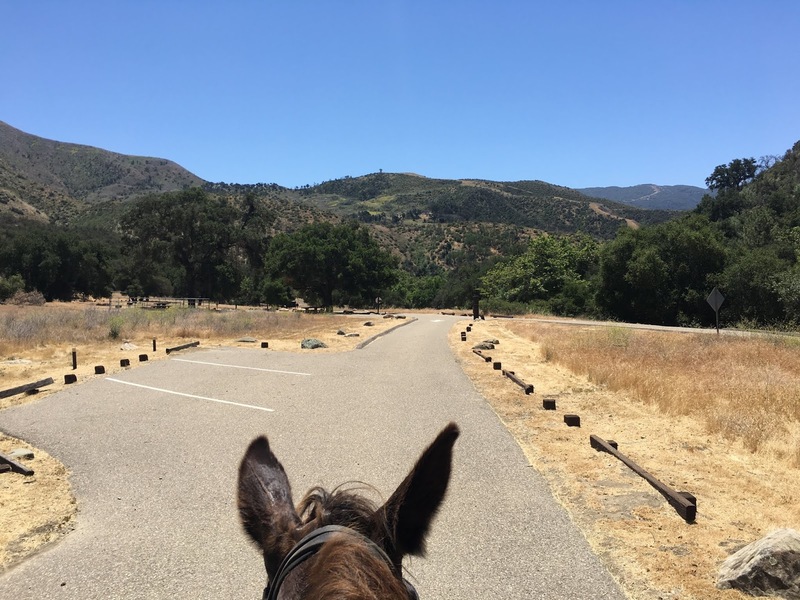 A group of eleven riders convened to ride from the Rancho Oso Thousand Trails Resort to explore what is left of the Upper Oso Campground. 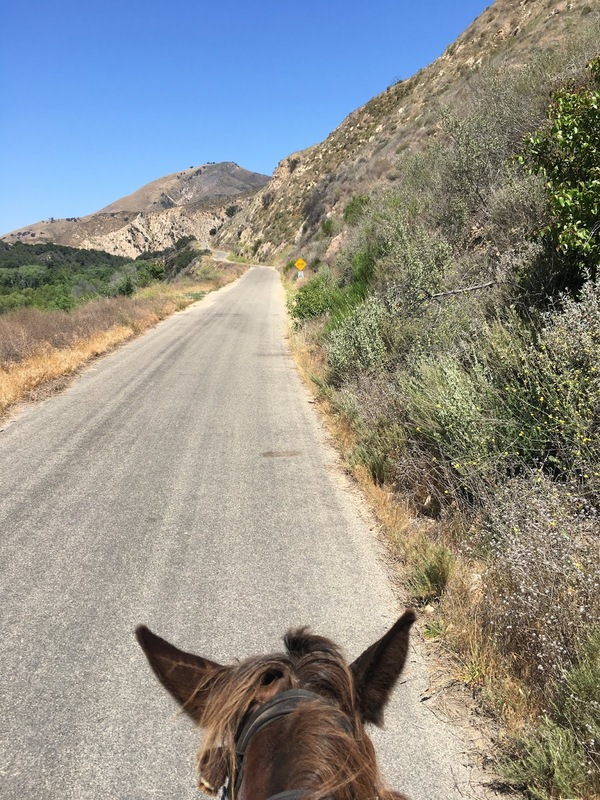 we kept up lively pace. 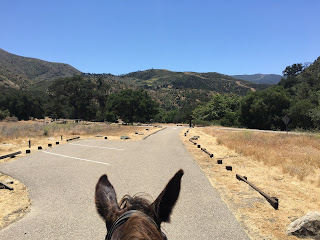 It was an 88 degree day with very bright sunlight, a good day to move fast and generate some cooling wind. 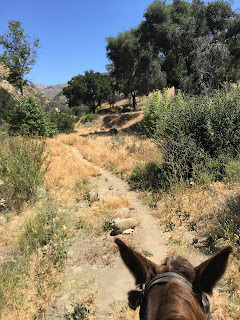 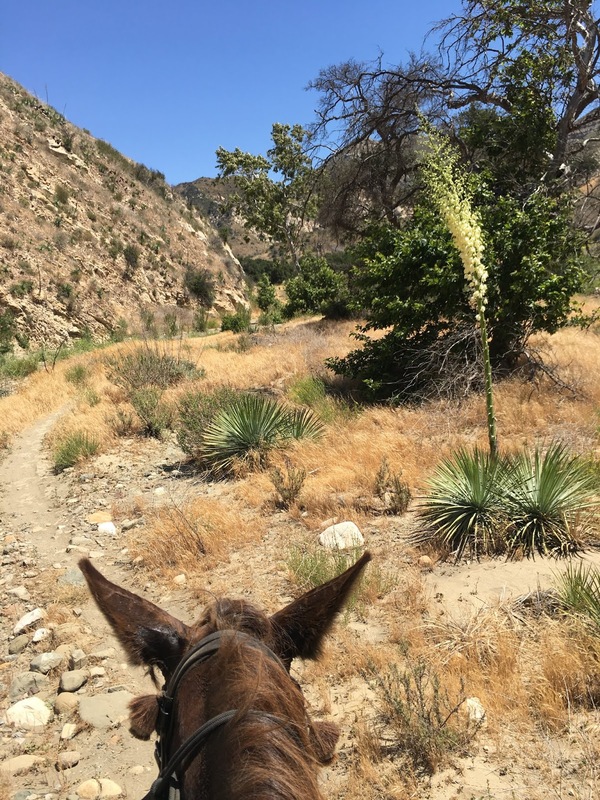 We left the paddocks at Rancho Oso and traveled across the BathTub Trail. 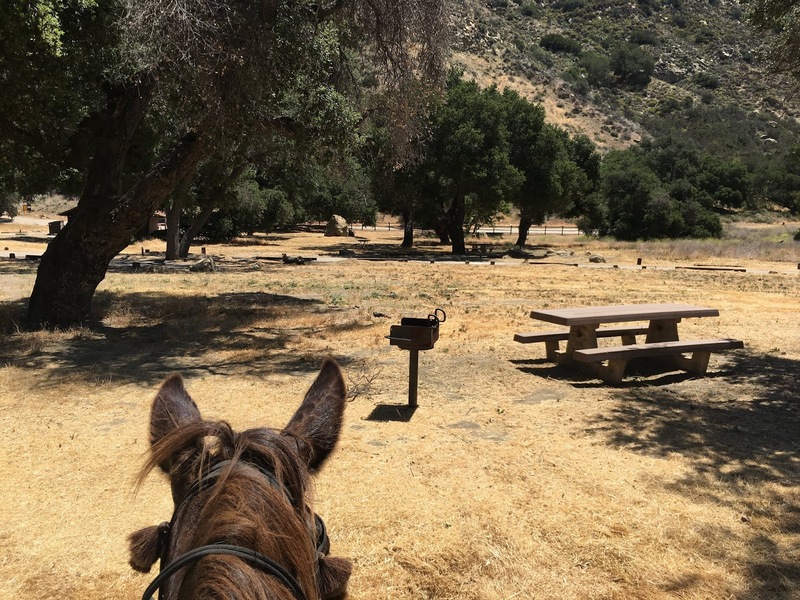 Immediately the sounds and sights of the recreational facility are left behind, and the sounds of nature pervade. Then we turned down the Arroyo Burro Trail towards the Santa Ynez River. 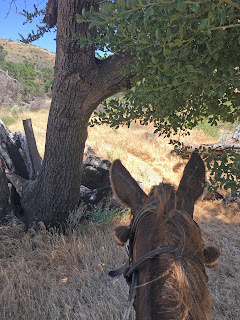 Good to savor the shade while we had it. 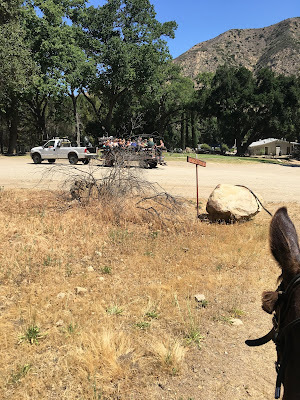 As we came off the horse trail we saw a group of campers being dragged along by one of the resort's trucks, sort of like a hayride with no hay. 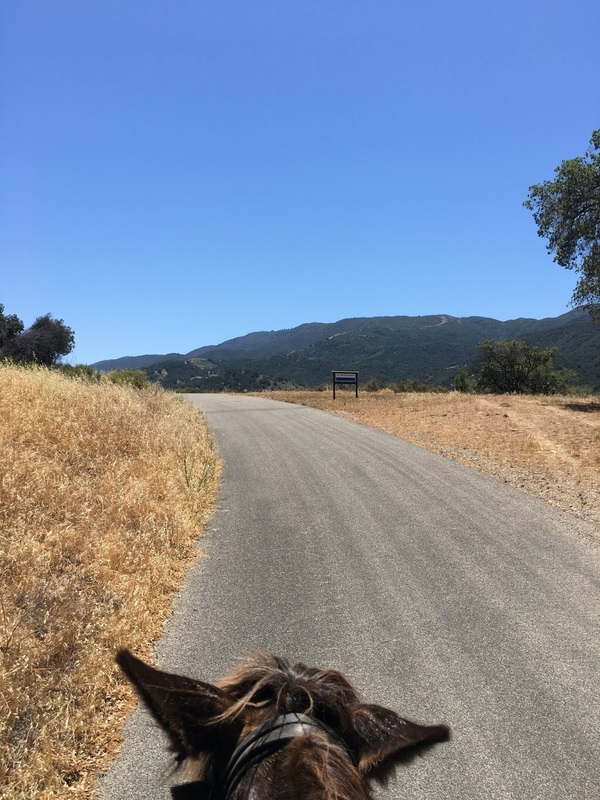 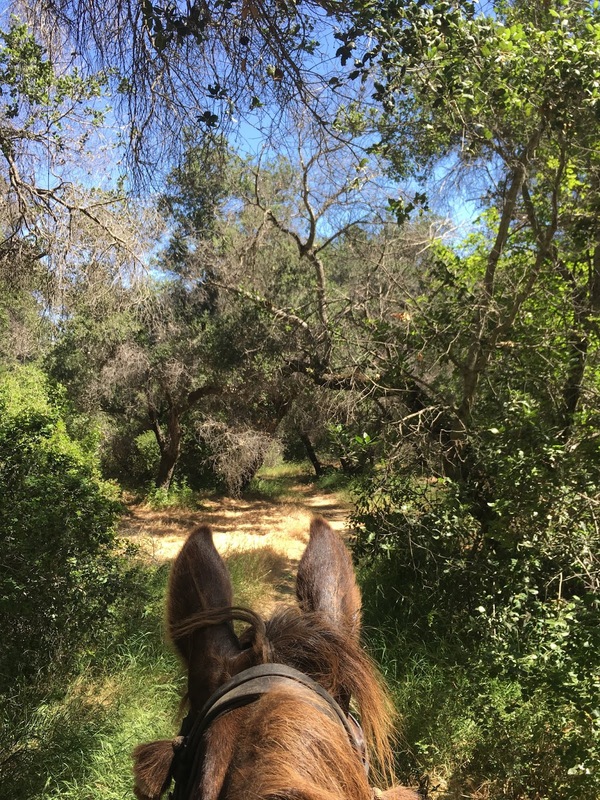 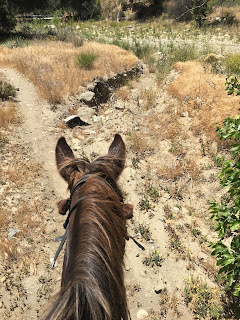 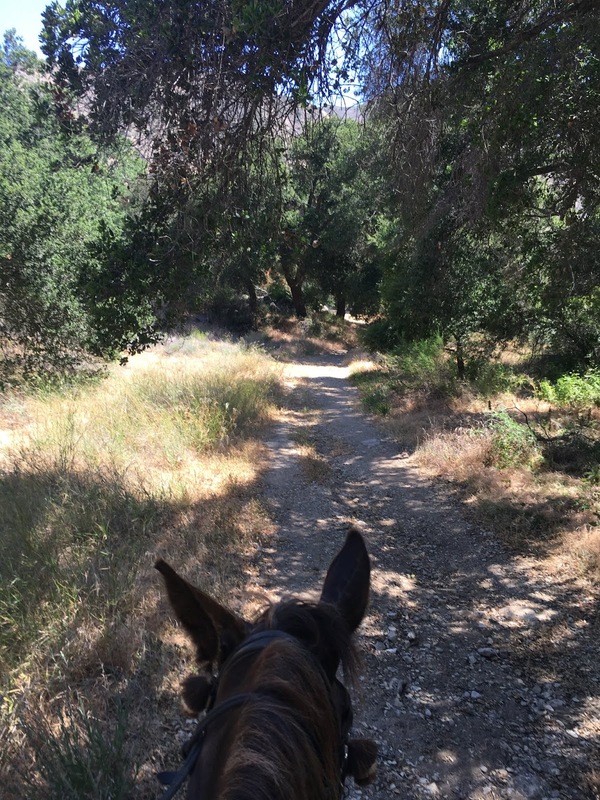 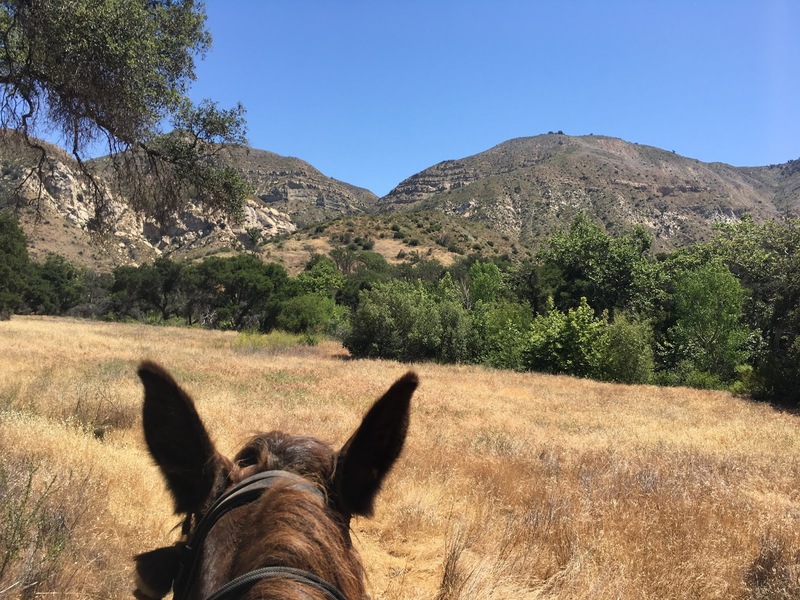 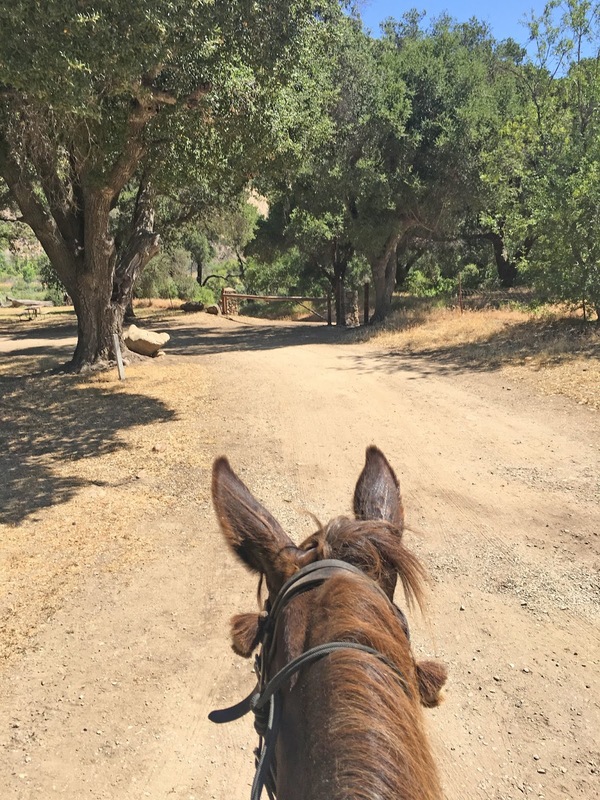 I have a commitment to the idea that every trail ride should stretch the horse and rider, and their connection, and one of the best ways to do that is try simple exercises while out on the trail. The people who fumbled it on yesterday's ride were all able to accomplish it today! Then we walked down to the one remaining river crossing. 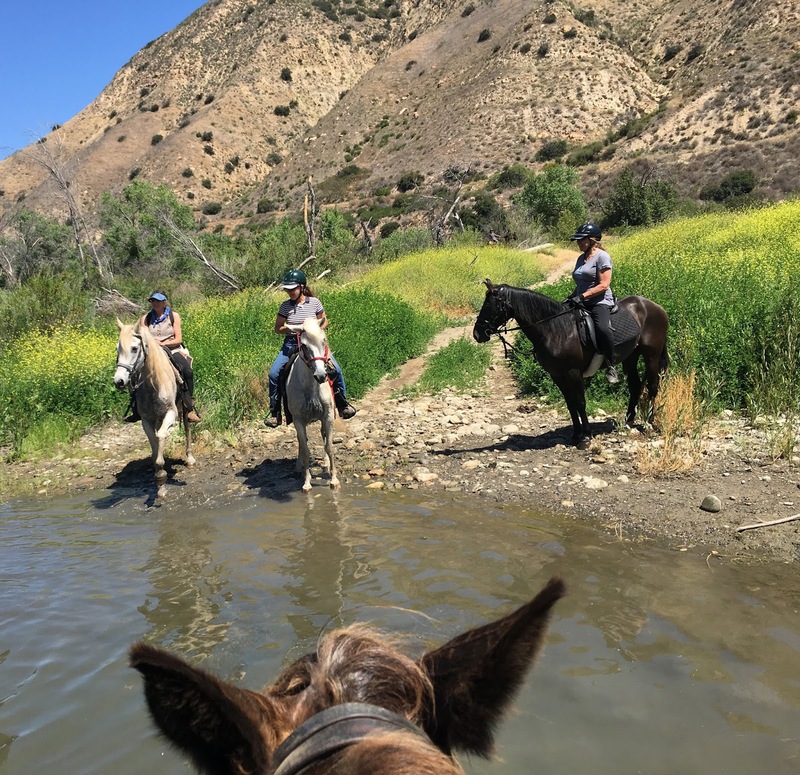 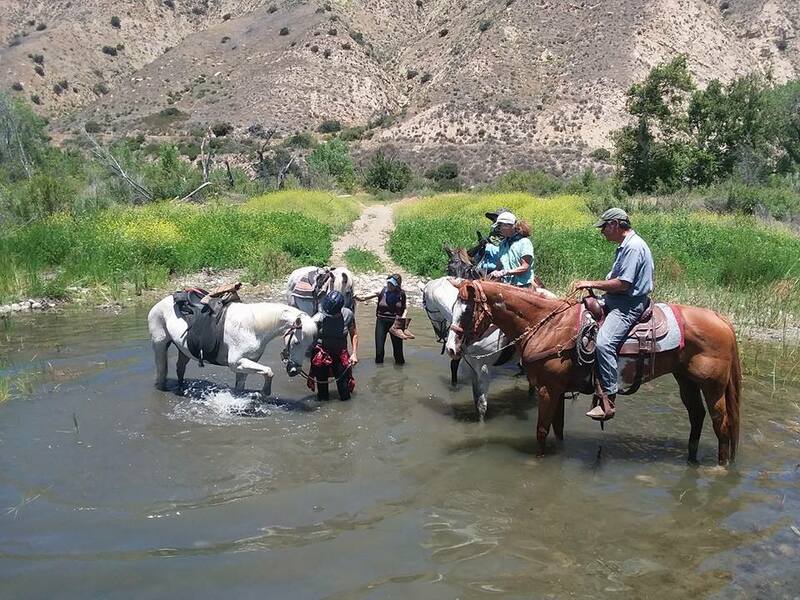 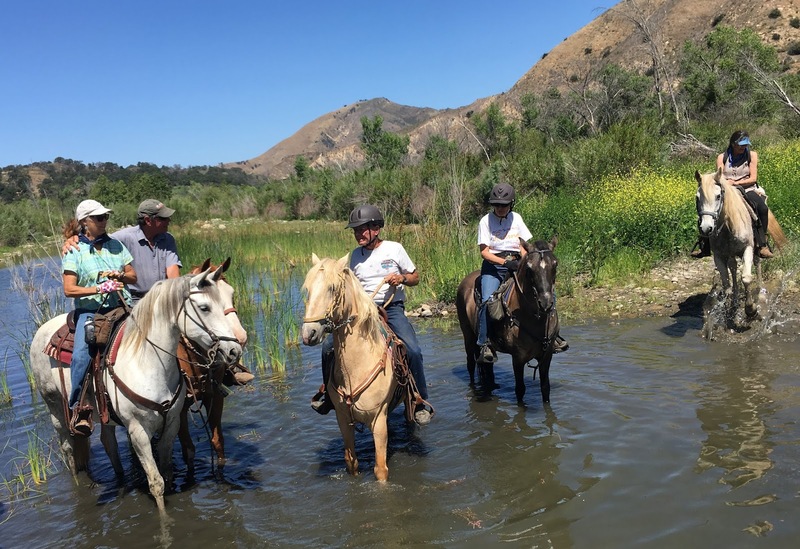 We let the horses play in the Santa Ynez River for a while, cool their hooves before tackling a long hot walk on Gibralter Road. 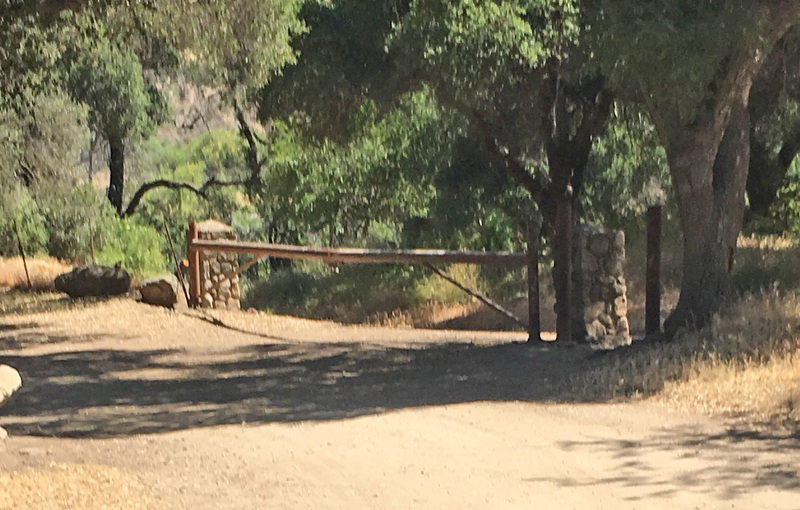 From the river the Arroyo Burro Road leads up to the main road, where a locked gate prevents admittance to all but emergency vehicles. 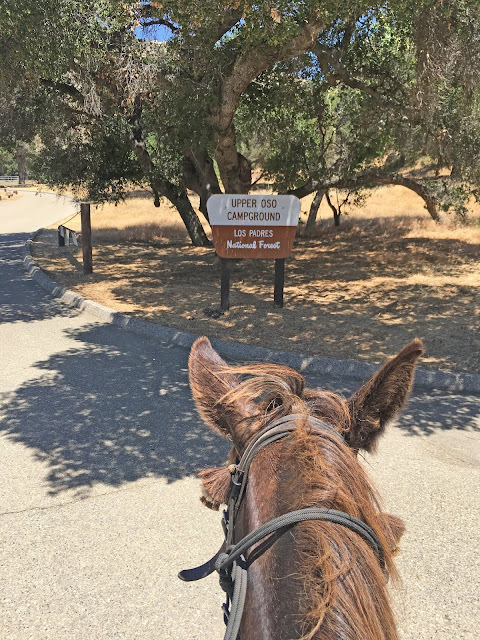 Gibralter is currently closed to all but hikers, bicyclists, and we fortunate equestrians. 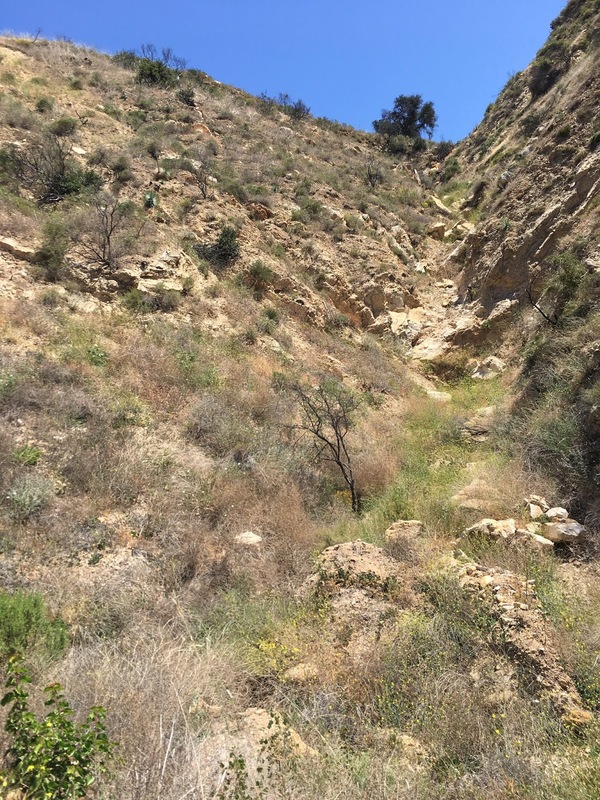 The mountainside is extremely steep and shows the signs of active erosion. 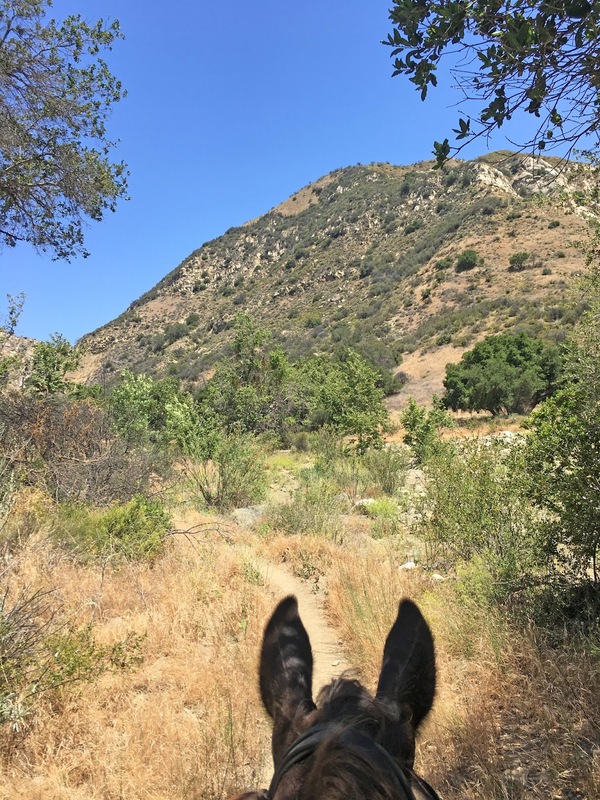 Too craggy even for my mule! 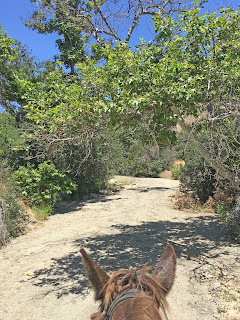 But soon we left the road and started up the canyon. 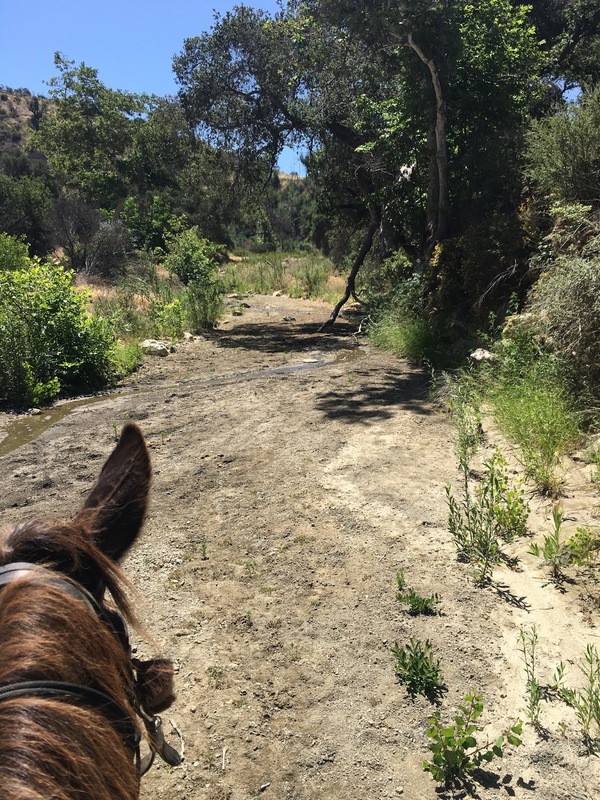 The creeks also showed widening, what used to be a small stream you could step over was now a wide muddy channel. 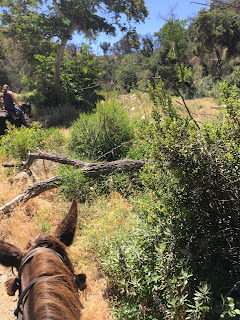 Lots of overgrowth, fallen trees and trail obstacles. 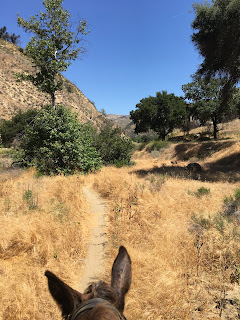 We followed the winding path up towards the upper canyon. 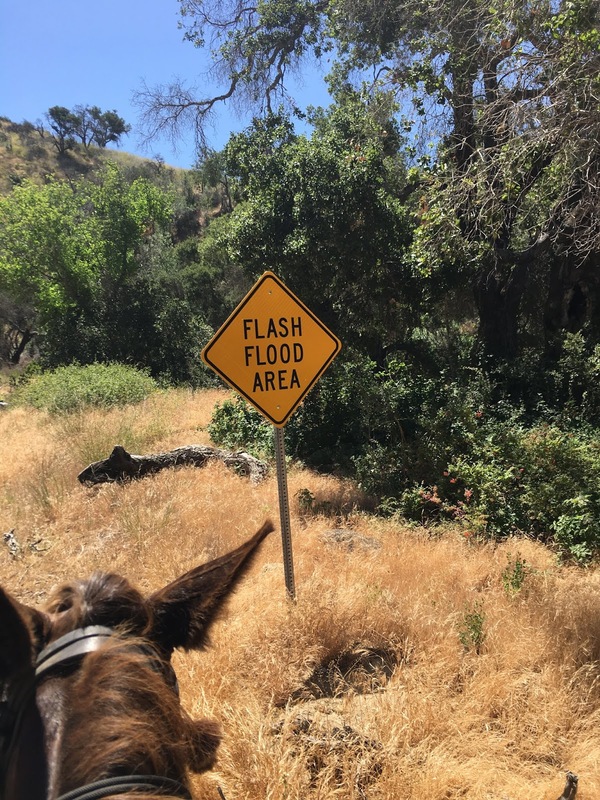 The sign stands silent sentinel to the destruction we are about to see ahead. who was just here last weekend and so knows the trail with confidence. Because the trails are no longer being maintained, obstacles like low-hanging branches that must be bashed through (or where possible, walked around) are frequent. 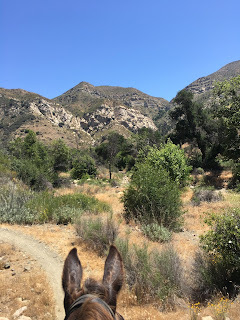 Wouldn't be so bad but for the ticks that lurk in them, waiting to drop. 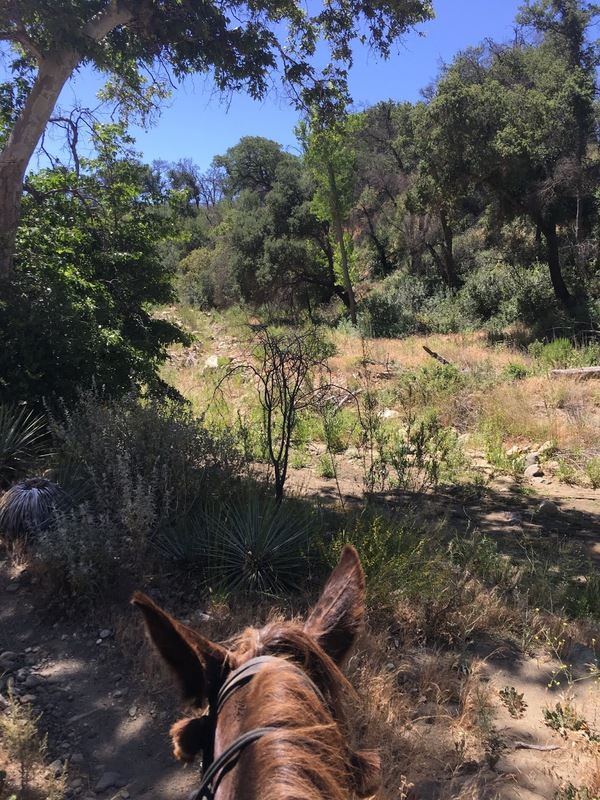 But the landscape is totally worth it. Because vehicle traffic is blocked from coming in here the utter stillness is eerie, and feels like traveling back in time. 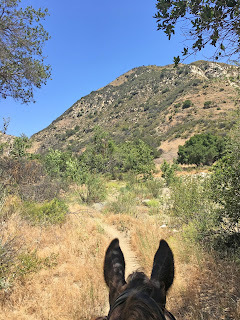 The mule alerts every so often to things he perceives in the landscape. His senses are far more acute than mine, and I have learned to pay attention to him. 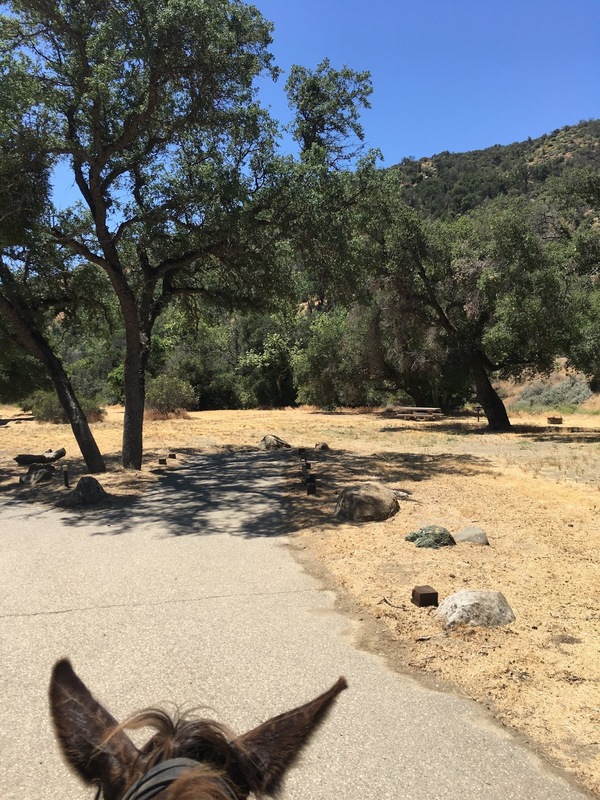 Although in this position they are saying he's attentive to the path ahead but also listening to me whistle. 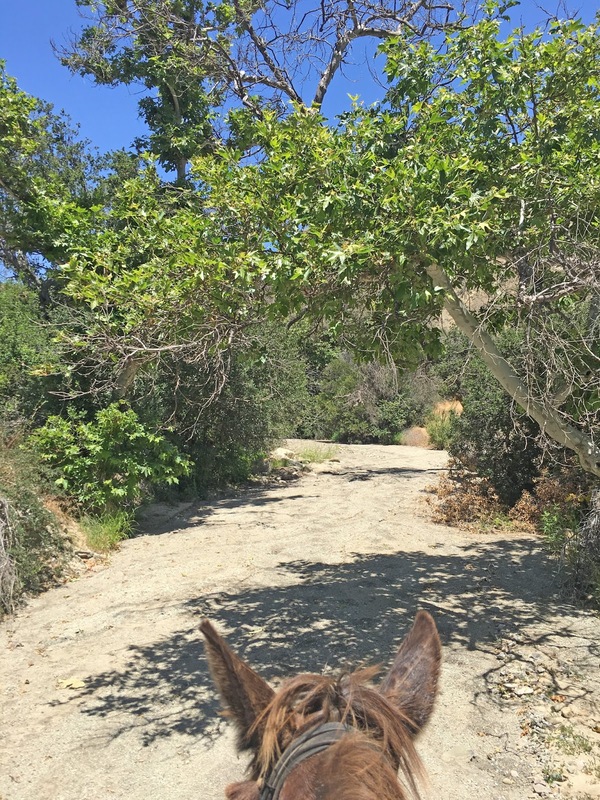 I like to whistle a jaunty tune as we travel along, matching the cadence of his hooves. 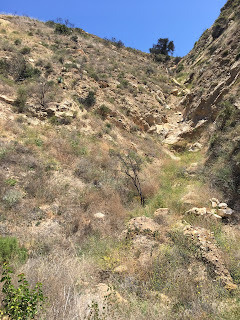 The closer we get to the end of the canyon, the closer we are to the campground. 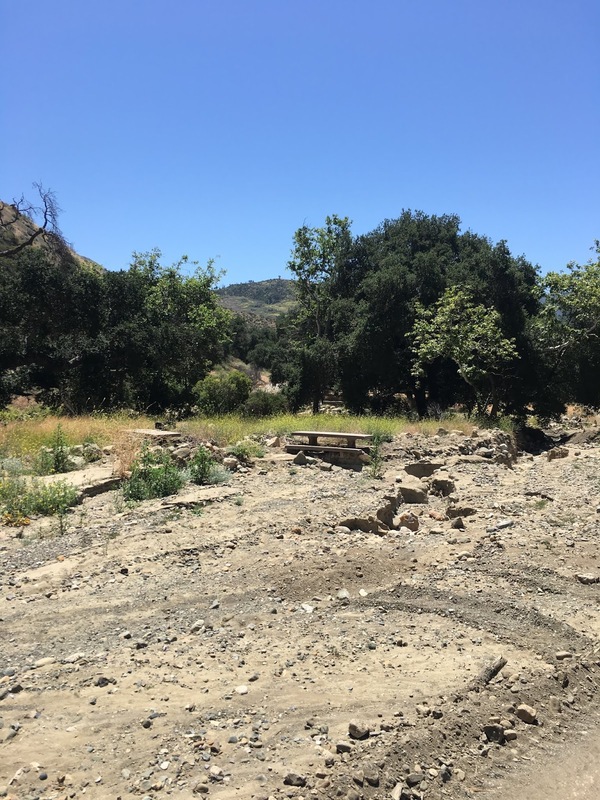 Now shuttered, destroyed by fires, debris flows and floods in 2017, and with no plan for reopening. 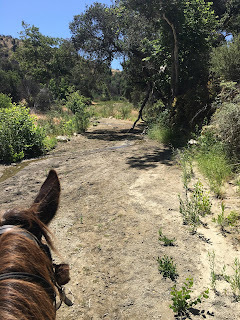 I led the group up a dry riverbed, that used to be a creek and is now an arroyo. Then into the deserted campground. In some parts it merely looks overgrown with weeds, waiting for the tents and bar-b-ques to be brought in and the canyon ring again with the laughter of children on holiday. But in other places it is obvious that the roads were cleared by scraping massive amounts of mud silt and boulders off of them. And these cement picnic tables were driven far from their original spots by the force of the mud flow that channeled out former campsites into masses of rocks. 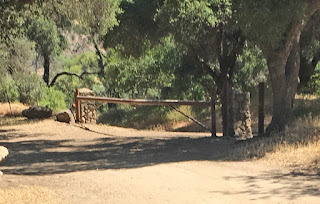 No water, the pipes are all burst, and so no access allowed. 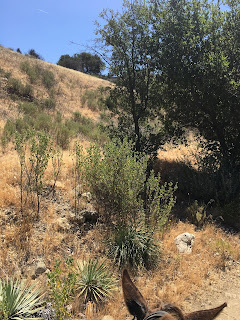 A Make Work Project awaiting funding. So we turned around and came back out the valley. 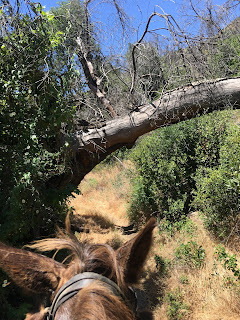 On the way up Tobe and I had gone off trail and around this fallen tree, but on the way down I hunkered down and he shimmied under it. 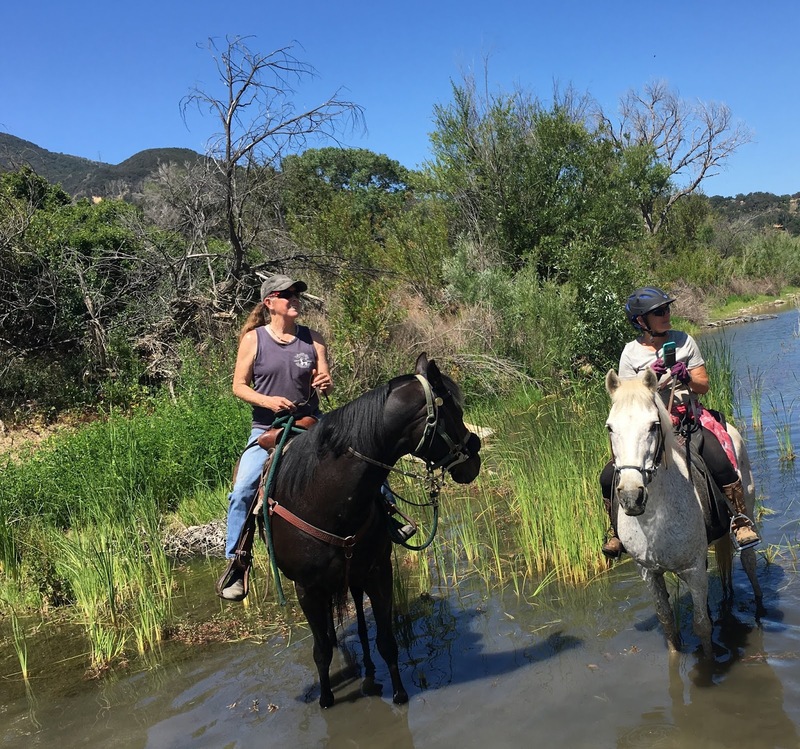 Good to practice such skills for the time when they might be life-saving. 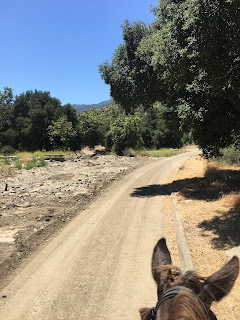 Once you've seen an area devastated by a mud or debris flow then you start noticing other changes in the landscape, like this channel cut by water flowing down the path then diverting over to the creek. 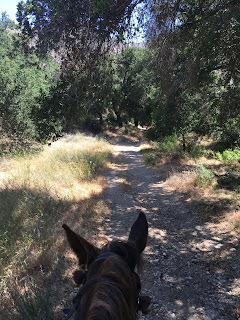 But by now the animals were sweaty and we are ready to head back down the deserted road to civilization. 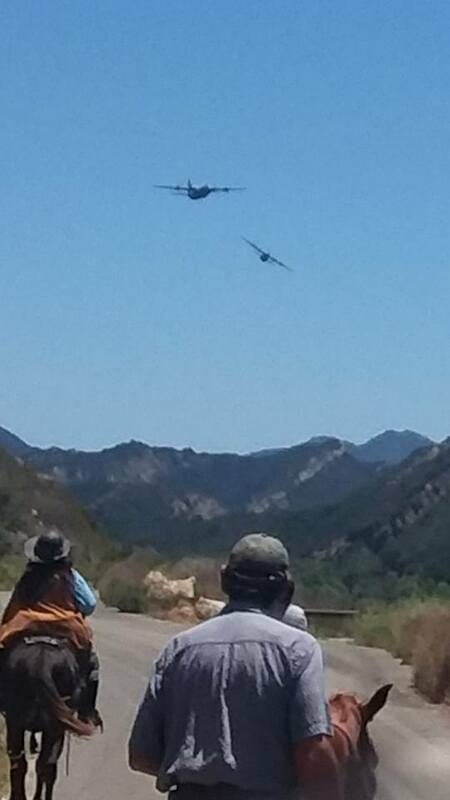 But a surprise was in store for us, two huge WW2 Air Force planes came zooming down the river course. At first they looked like gliders, but when they were close they were huge and very loud. 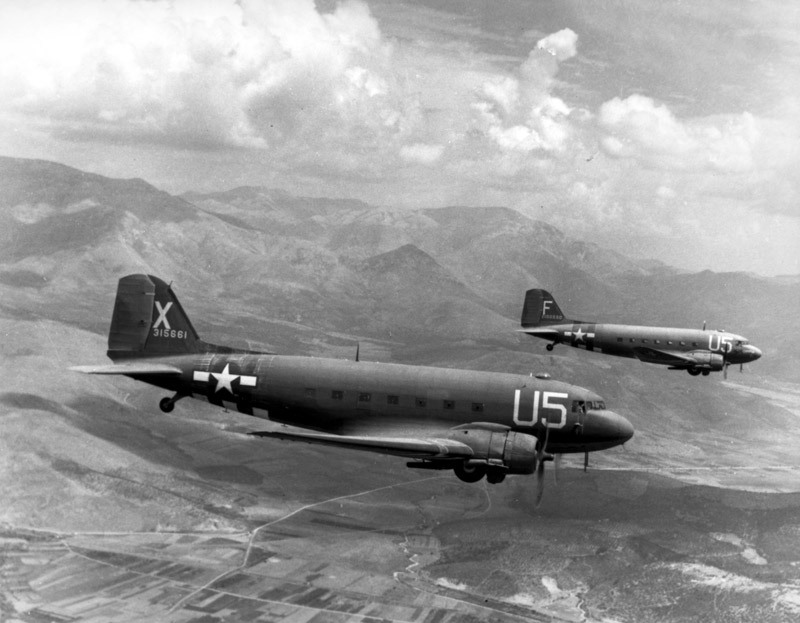 I'm going to go out on an uneducated limb and say they looked to me like C47s. Then back at the river, where two of the ladies dismounted and soaked in the water. 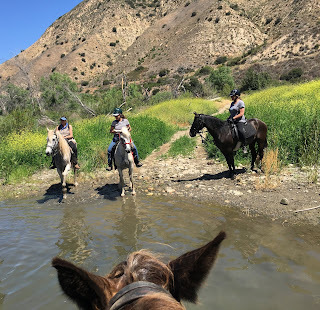 Hydrotherapy. Then we went back to the campground, and on the way passed the same group of turkeys we saw yesterday. 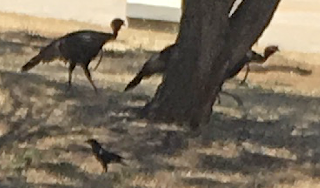 This time accompanied by a crow. 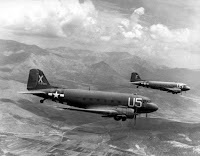 They were our only wildlife for the day, unless you count Air Force pilots. 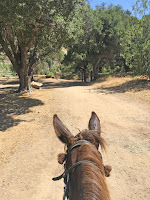 "Now, there are two ways of learning to ride a fractious horse: one is to get on him and learn by actual practice how each motion and trick may be best met; the other is to sit on a fence and watch the beast a while and then retire to the house and at leisure figure out the best way of overcoming his jumps and kicks. 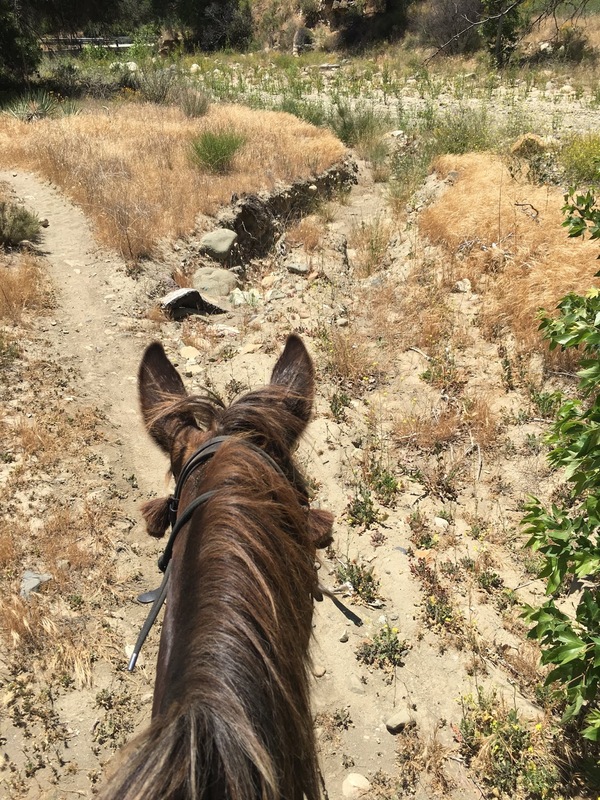 The latter system is the safer, but the former, on the whole, turns out the larger proportion of good riders. 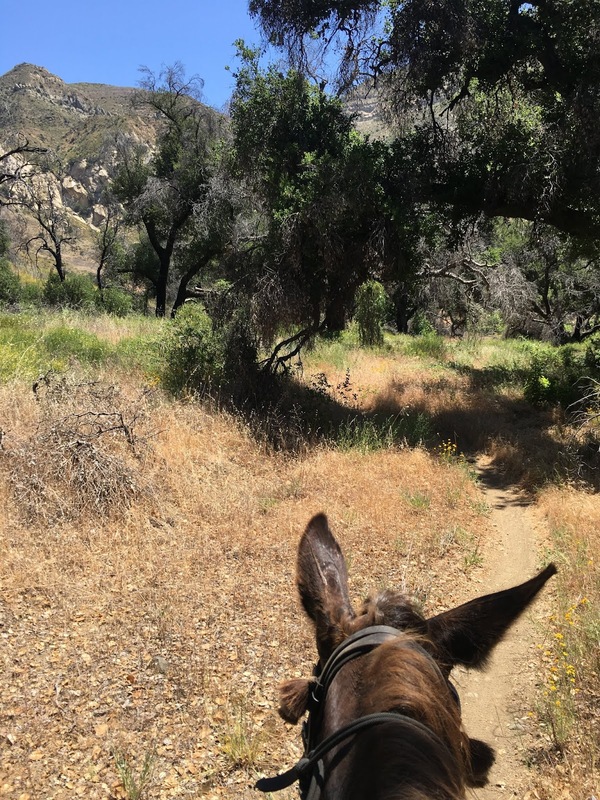 It is very much the same thing in learning to ride a flying machine."